This Sunday during the Super Bowl, Pizza Hut will produce over two million pizzas that will be consumed by football fans as they watch the game. Among the fans will be Pittsburgh Steelers running back DeAngelo Williams. For Pizza Hut, the largest pizza restaurant in the world, the day of the Big Game is also the largest delivery day of the year. To prepare, Pizza Hut hired an additional 11,000 employees. 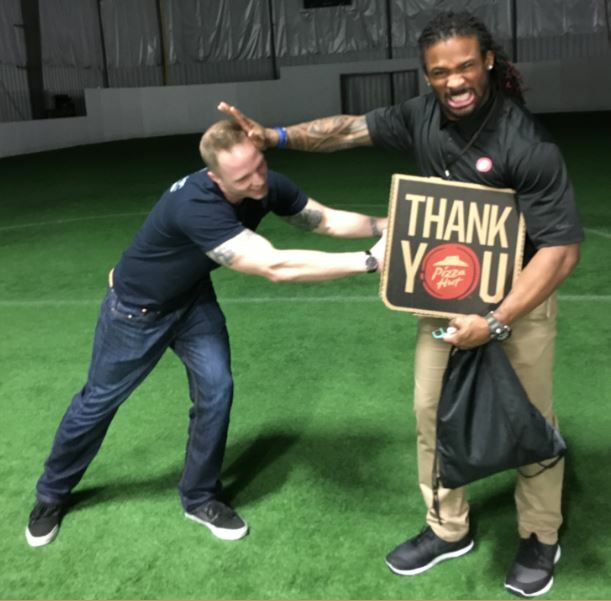 Last week in Pittsburgh, I hung out with Williams and watched him put delivery drivers through various drills at the Pizza Hut Delivery Combine. “Coach Williams'” whistle never seemed to get a rest. When he wasn’t scolding Pizza Hut delivery drivers, I challenged the Carolina Panthers’ all-time leading rusher to a 40-yard dash and asked about his unexpected big role in the AFC Championship, what kind of pizza he will eat while watching the game this weekend and whether he get his picture taken with the iconic Franco Harris statue at Pittsburgh International Airport like I did. To view the Pizza Hut Delivery Combine videos, follow Pizza Hut on social media at Facebook.com/PizzaHut and YouTube.com/PizzaHut, and visit PizzaHut.com to pre-order pizzas for your Big Game party using the quick and easy online order service, including any two medium pizzas for $6.99 each to satisfy everyone on your team.